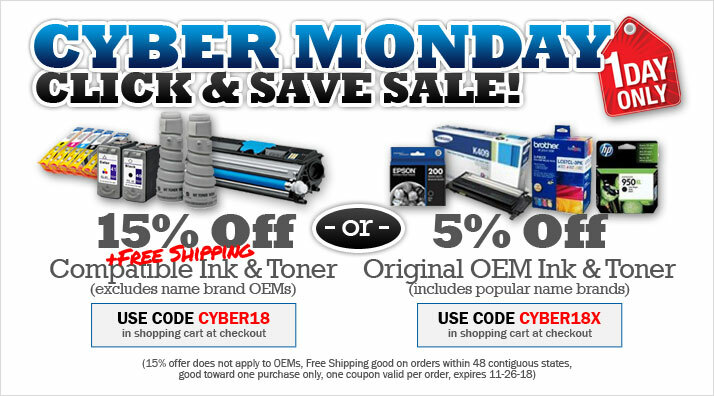 Shop Ink4Less Cyber Monday and enjoy one of our biggest sales of the year. Shop online and save big with 15% Off plus get Free Shipping on your entire remanufactured or compatible ink and toner order (excludes OEM purchases). Some restrictions apply. Discount does not apply to OEM products, Free Shipping good in 48 contiguous states, good towards one purchase only, cannot be combined with any other offer. Offer available Monday, November 26th 2018. Expires Monday, November 26th 2018.